Higher resolution audio and video, faster refresh rates, and more bandwidth will enable better experiences with movies, games, VR, and more. HDMI 2.1 is here, delivering breathtaking bandwidth and enabling a raft of new capabilities. The new standard won't impact the average user today or even in the near future, but new hardware coming to market within the next year and into the next decade will deliver better experiences with movies, games, virtual reality, and more. Increased bandwidth is the most salient improvement HDMI 2.1 delivers. We're talking a staggering 48 gigabits per second, compared to the 18Gbps that HDMI 2.0 can handle. That bandwidth bump makes possible all of the larger numbers you'll see in the rest of this story: 8K and 10K video resolution, 4K resolution with a 240Hz refresh rate, and so on. 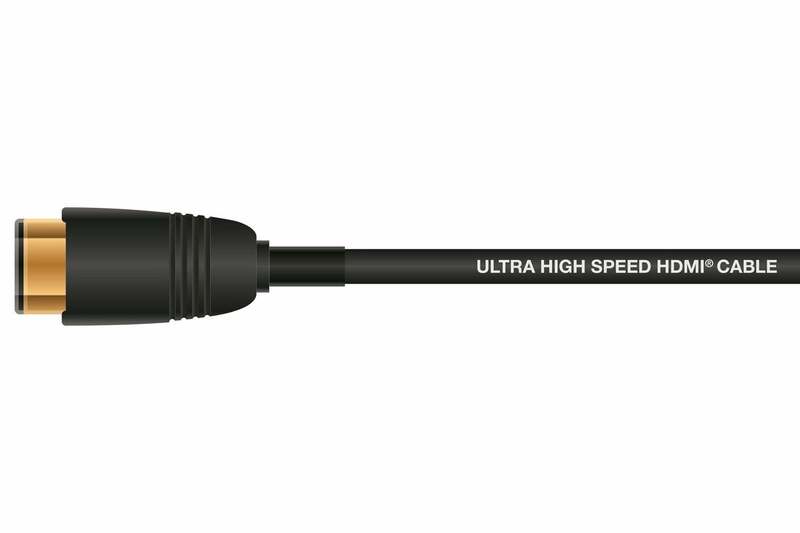 You'll need a new cable--as in the render above, it will be labeled Ultra High Speed HDMI--but that's a small price to pay for what's delivered. HDMI 2.1 also supports VESA's Display Stream Compression (DSC) for even greater bandwidth. 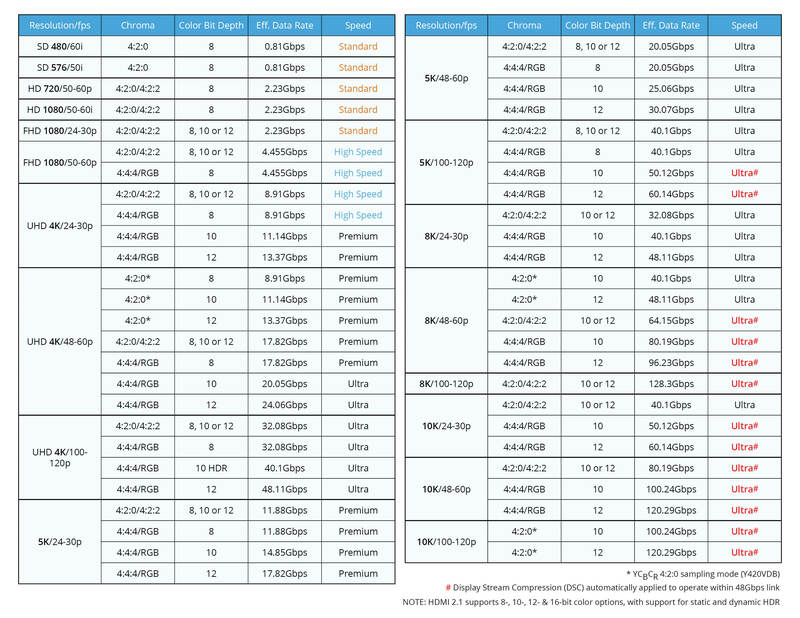 In fact, some of the higher resolution/frame rate combinations you see listed in the chart below can only be realized when DSC is in use. Note that these are only common possible resolutions and frame rates. For example, 4K at 240Hz can be used if so desired. Where these higher refresh rates will come in handy is with HFR (High Refresh Rate) video. You might remember the first installment of The Hobbit was shown in select locations at 120 frames per second. Why? To reduced the motion blur with fast moving items that is a weakness of slower frame rates. With HFR, you can see the rain drops in a storm. Without it, they're indistinct. HFR in the home is a long ways off, but Hollywood, industrial, and scientific uses are myriad. HDMI's bandwidth also allows much higher video resolutions. Did you know that the 2020 Olympics will be broadcast in 8K? They will. Where will you be able to see that? We're not altogether sure. 8K displays have been announced, but they're largely for gaming, industrial, and advanced imaging applications. For the average person, 8K is massive overkill. We don't even have 4K broadcast TV, and the industry is having a hard time convincing users simply to upgrade from 1080p to 2160p. And there are other concerns with greater resolutions: 2160p (4K) video consists of four times the number of pixels that 1080p does, and 4320p (8K) video requires four times the number of pixels of 2160p. The more pixels the more energy, CPU power, GPU power, memory, and storage needed to process and store them. We're not pooh-poohing higher resolutions; they look fantastic. But for now, they're niche technology you won't see for quite a while. HDMI 2.1 also supports color depths up to 16 bits, though humans can hardly distinguish 281 trillion shades. If you haven't seen true HDR (high dynamic range), you're missing out. Its improved color and increased contrast offers a far more dramatic improvement in picture quality than the bump from 1080p to 2160p resolution. Having exposed our building manager to Dolby Vision with several movie titles, he reported a mild bout of depression after returning to his own SDR TV at home. To be blunt, most viewers here, when given a choice between 2160p without HDR and 1080p with Dolby Vision, chose the latter. It's that much better. These images don't fully convey how much of an effect HDR can have. The image at the top right is roughly what you'll see from Dolby Vision and possibly HDR10+, while the middle image correlates to HDR10. 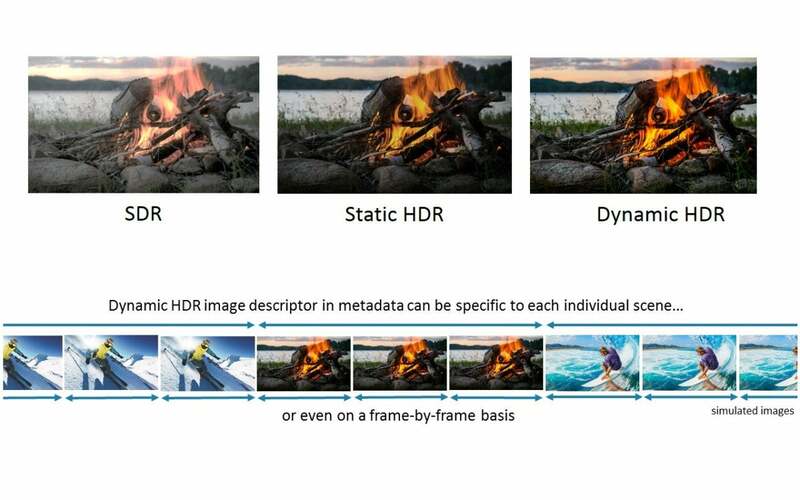 The second row of images explains how dynamic HDR works. Dolby Vision works its magic by continually instructing the TV how to adjust its image to best render each scene, or in some cases, individual frames. These continual instructions are called dynamic metadata, and HDMI 2.1 now offers an integrated mechanism for transmitting them. That opens the door for truly effective HDR (HDR-10 is only partially effective) that doesn't require paying Dolby royalties. Whether that will lead to anything soon is questionable, as Dolby Vision is entrenched rather deeply after only a year on the market. Note that the upcoming HDR10+ does not rely on HDMI 2.1, but like Dolby, can transmit its dynamic metadata over HDMI 2.0. Gamers and VR enthusiasts should enjoy better experiences via HDMI 2.1. 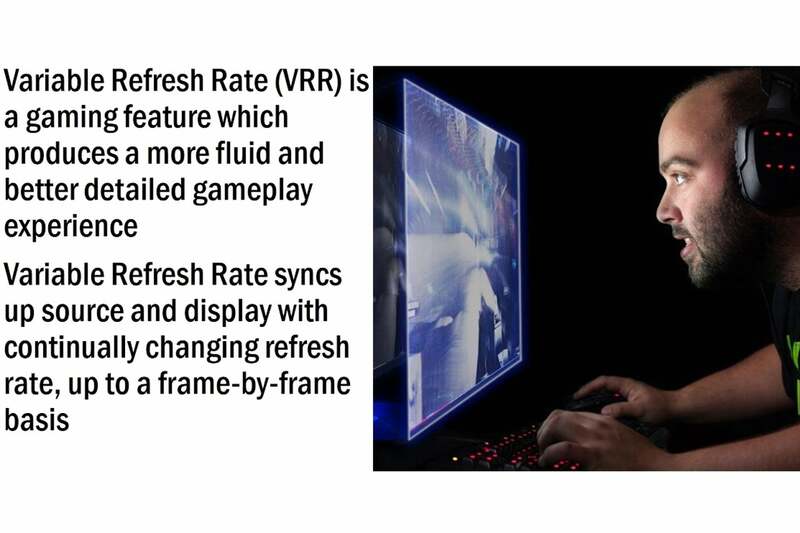 A couple of HDMI 2.1's latest features are aimed squarely at the gaming and VR crowd: Auto low latency, which reduces the lag time between user actions and what happens on the display; and variable refresh rates, which should make it easier for VR headsets and gaming consoles to sync up with display equipment. The next new item on the list is eARC, or enhanced Audio Return Channel. This is a feature of HDMI that allows a television to send audio (from its onboard tuner or--in the case of a smart TV--from its media-streaming apps--back down the cable to a speaker or A/V receiver. 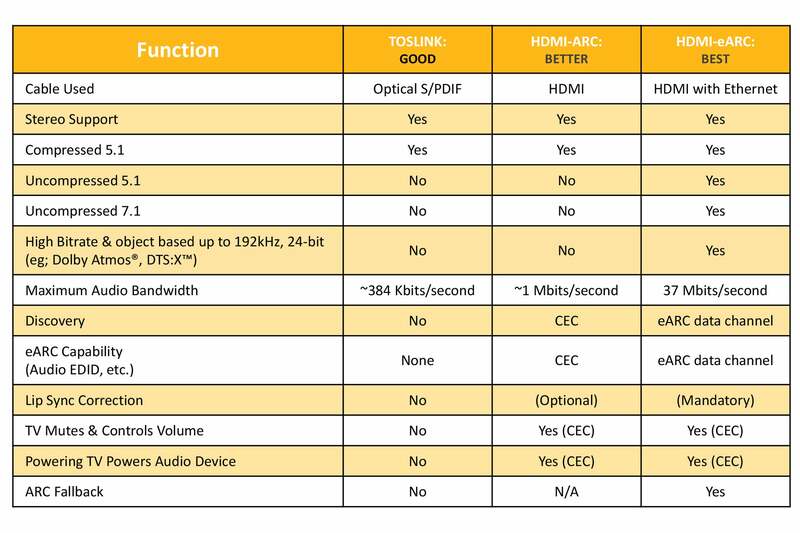 The amount of bandwidth available for audio information carried over HDMI has increased from about 1MBps to 37MBps, sufficient for all the latest surround-sound codecs. Again, all the improvements are due to greater bandwidth. In this case 37MBps as opposed to around 1MBps for HDMI 2.0. This allows for high-bandwidth, object-based surround-sound codecs such as Dolby Atmos and DTS:X. On a side note, delivering audio at 192kHz is a massive waste of bandwidth that describes frequencies that aren't present in the source material, and couldn't be heard if they were. A perception that higher numbers mean better audio persists in the marketplace. In one case it's almost correct, 24-bit audio, as opposed to 16-bit, does lower the noise floor to where it's imperceptible to super ears even in treated, uber-quiet environments. Assuming of course, that's what you want. It can be eerily unnatural, especially for city dwellers. Regardless of caveats, surround-sound fans will find the support for better surround rewarding. Note that eARC requires using an HDMI cable that supports Ethernet. 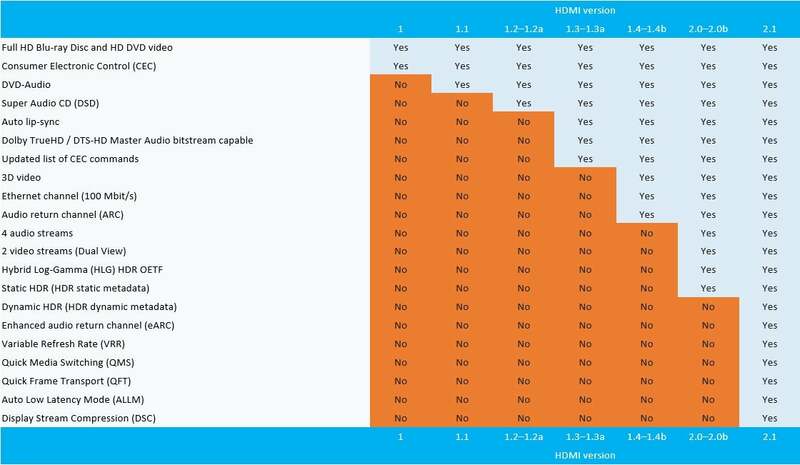 This table shows the features enabled with each version of HDMI. As much of a step forward as HDMI 2.1 is on paper, the benefits that the new specification will deliver to the typical consumer are a long way off. As far as we're aware, it's not yet enabled in any silicon, which means we won't see HDMI in consumer products until late 2018 or early 2019. When HDMI 2.1 does arrive, it will be in high-end video cards aimed at gamers, and in medical, industrial, and scientific imaging systems. As the 2020 Olympics will be broadcast in 8K, we wouldn't be shocked to see an 8K TV appear before then. We would be shocked if the average buyer could afford it. But then again, what's life without a few surprises.? Kudos to the HDMI Forum for addressing just about everything vendors have been clamoring for. Note: This article was updated 12/6/2017 to replace the features and refresh rate images with new ones provided by HDMI Licensing.